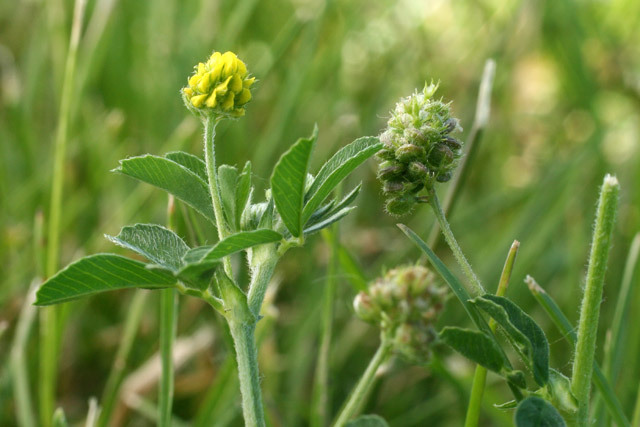 There are several clovers and clover relatives that have small heads of yellow flowers. These are members of the pea or legume family, Fabaceae, that have individually small flowers arranged in heads (or umbels that look like heads because the flower stalks are very short). The leaves are trifoliolate, i.,e, each leaf is fully and completely divided into separate leaflets. The leaflets are often mistakenly referred to as leaves, hence the proverbial “4-leaved clover” is actually a 4-leafleted clover! Plant genera with similar flowers are often differentiated by their fruits. Clovers in the strict sense, i.e., members of the genus Trifolium, have flowers that retain their petals into the fruiting stage, surrounding the small legumes. 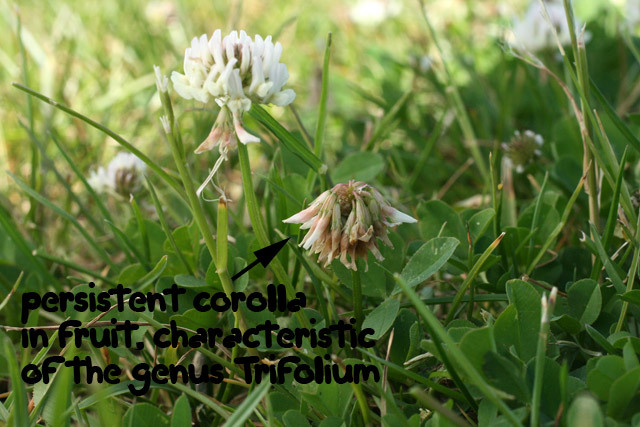 This is evident in the fruiting heads of a large clovers such white clover, Trifolium repens. 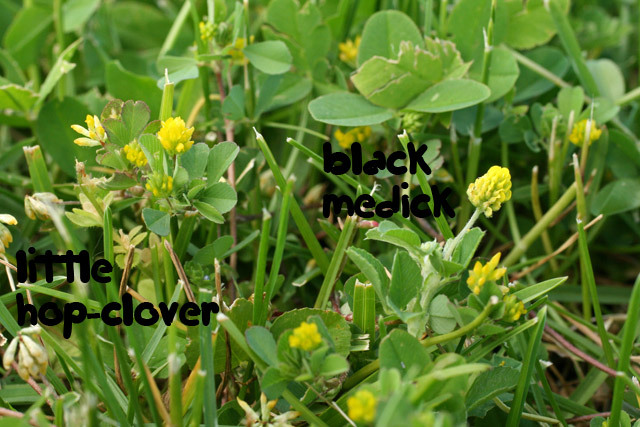 Only one of the lookalike legumes shown above is a true clover in the genus Trifolium. On the left, it’s the smaller species with fewer flowers, one of the hop-clovers, T. dubium. They’re called hop-clovers because, when in fruit, they resemble clusters of hops,the beer-flavoring agent. 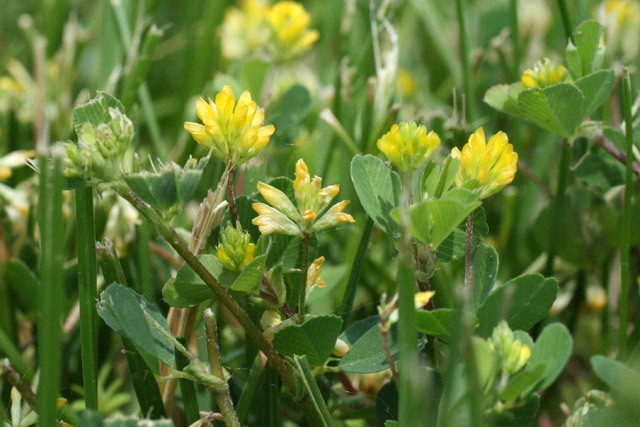 It’s interesting to note that although clovers are widespread and familiar, there’s only one native clover in Ohio (the extremely rare buffalo clover, T. stoloniferum). Here is a list of Ohio clovers from the spreadsheet generously provided by the Ohio EPA as part of their “Floristic Quality Assessment Index (FQAI) for Vascular Plants and Mosses for the State of Ohio,” by Barbara Andreas, John Mack and James McCormac, 2004, Ohio Environmental Protection Agency. Names in UPPER CASE are introduced species. Clovers of Ohio, all but one are aliens! On the right in the picture at the top of this post is a little yellow clover-like thing that isn’t a clover at all. It’s black medick, Medicago lupulina. In Medicago, the petals fall off after flowering and the little legumes are thus directly visible. They eventually turn black, which I guess is why a yellow-flowered plant is called black medick. 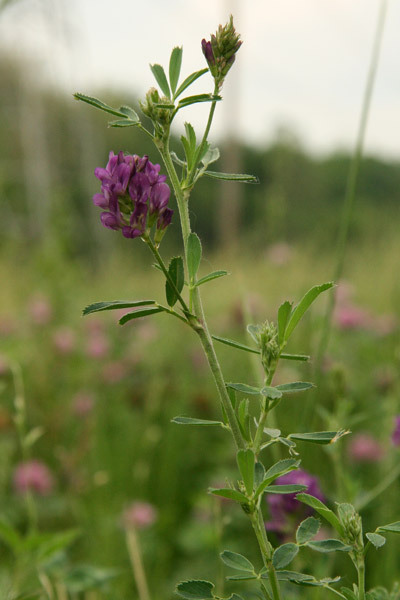 Perhaps surprisingly, because it has purple flowers and looks so different, Ohio’s other Medicago is alfalfa, M. sativa.